You may be asking yourself this question. So, if you don't know already, let me try and give you a flavour of just what Wolfram was like, and what he could do. Considering the very little sight he had, he was a miracle. With all the complicated sound recording machines, he had to memorize what each button did. When he got a new machine, he would ask me to read the instruction book through to him. While I did this he sat at his desk, listening intently, finding the buttons and committing them to memory. Sometimes he would stop me and ask me to read a passage again. He only needed it reading once. Usually, after about two weeks of using the machine, he would ask me to read the book again. That was it. And as for the wiring! I would find it a nightmare. But he could take it all apart and set it up again if he took it out to record a band. He loved photography, and took better photos than I did. I don’t know how he did it. He said photography helped, because while he couldn’t see some of the things I pointed out to him on our travels (he once stood in a field of poppies and couldn’t see any of them - red is a difficult colour to see apparently) he could see something of the photographs, with a strong magnifying lens he screwed into one eye. 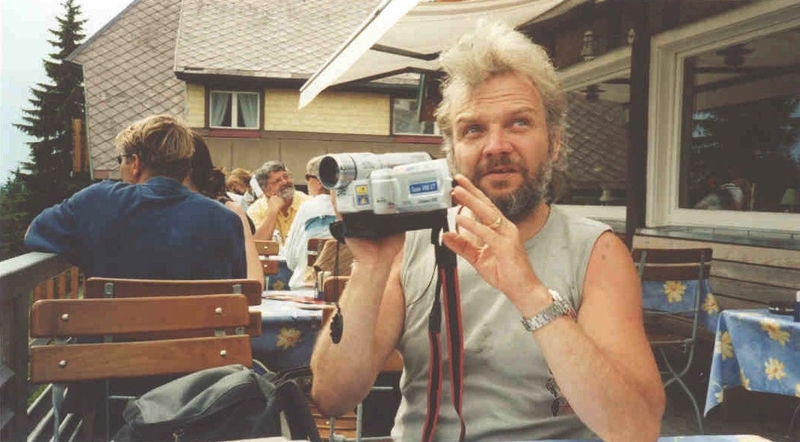 He was fascinated with the film camera the girl, Louise, brought with her when she followed us on our trip to Germany in 1995, and when smaller, lighter versions became available he bought one and filmed some of our holidays. He could ride a bike when all he could see were the white lines at the side of the road (he had no forward vision at all), but he did it. He was always happy with life and what he had. He was a great philosopher and helped a good many people when they got depressed. He always encouraged me to be who I was, and not what people wanted me to be. He loved and admired everything I did, was interested in my studies and loved it when I discussed what I was learning with him. He knew all there was to know about gardening, which he learned from his beloved Grandfather, who grew all the food for his family, yet he never said anything to me when I did things wrong. He had the patience of a saint and could keep quiet and let people find out for themselves. He would also refuse to enter into those discussions labelled 'what if?' He always said trouble would get here soon enough under its own steam, no need to meet it on the road. When we started appearing on tv he loved going to the studios, talking to the people and examining their machines and cameras. He could get on with anybody and I often parked boring people on him. His greatest thrill was when we turned up to film 'Married Love' with Steve Humphries and he found Ray Ennis (Swinging Blue Jeans) there - he got me to take this photo (bottom left). You can see he is pleased as Punch. The other picture is my all-time favourite. Wolf and I were waiting on this pavement in Como, Italy, for the bike bus to come and pick us up to go back to England. The bus was delayed and it was a long wait, but it was a Sunday afternoon, it was warm, and we had everything we needed. Suddenly this man came towards us, spotted Wolf, bent down to his dog and, pointing his finger, cried "Deutsch!" Wolfram managed to snap him at that exact moment. He stayed talking with us and told us about his life, pulling faded old photos out of a tattered wallet. 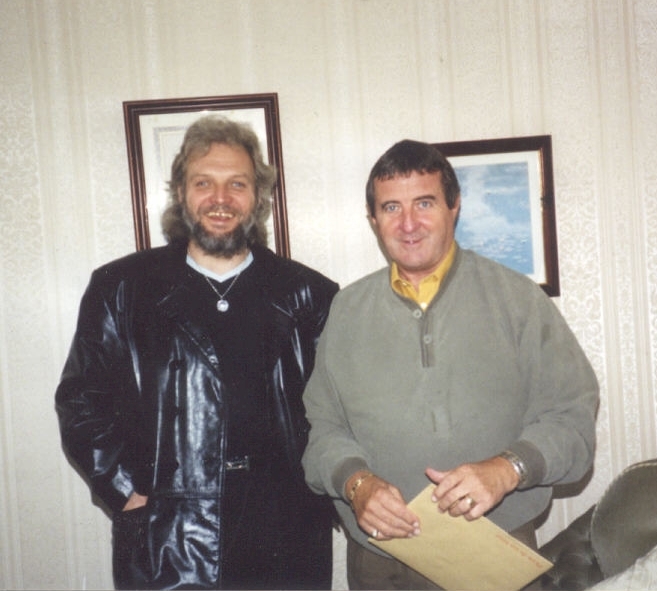 Wolf with Ray Ennis of the Swinging Blue Jeans (above). Right - "Deutsch!" 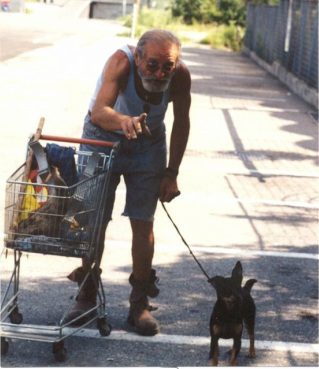 An old man on a pavement in Como, Italy, is in no doubt that Wolf is German. Wolf, you weren't just a remarkable blind man, you were an all round remarkable human being and I am so glad for the time we had together. I love you to bits, and I can't wait to see you again!